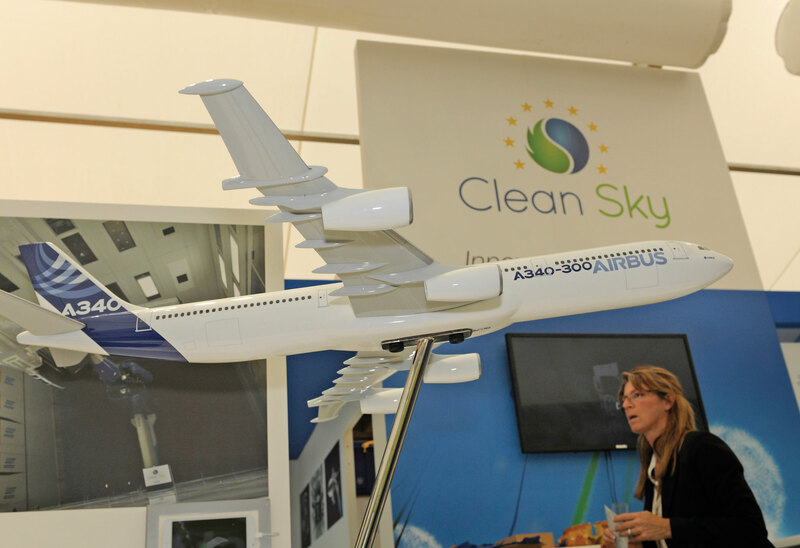 Clean Sky (Hall 4 Stand B10), Europe’s aerospace research venture, is exhibiting a model of a modified Airbus A340 with so-called “laminar flow” on an outboard section of the wings. The technology, if applied to the entire wing, could bring a 5-10 percent improvement in fuel burn. The A340 testbed is scheduled to fly next year. “Laminar flow is well known in laboratories but very complex on a real aircraft so if we succeed in measuring it on the A340, it will be a big step forward,” project officer Helmut Schwarze told AIN. A conventional wing profile sees essentially turbulent air. Schwarze targets a laminar flow of air on about 30 percent of the wing chord. This means that, flowing from the leading edge to the trailing edge, the air will run along constant streamlines. To achieve this, the wing should be thinner. It should be perfectly clean–splattered insects can ruin the profile’s effectiveness. A special coating is in development to prevent dirt and insects from sticking to the surface. However, it will not be ready for the upcoming flight tests, Schwarze said. Both outboard sections are being built in carbon fiber but with different techniques. Saab is responsible for an integrated design on the right one. GKN uses a more conventional method, with more parts, on the left wing. To evaluate the actual laminar flow in flight, an infrared camera will be installed at the top of the vertical tail plane. It will measure surface temperatures on the wings. The level of turbulence, if any, can be deducted from these, Schwarze explained. Before the 150-200 flight hour campaign starts next fall, the old, modified A340-300 will have to apply for a flight permit–not the smallest challenge in the project, Schwarze said. Airbus is a stakeholder in Clean Sky and owns the test A340.